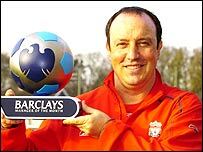 Liverpool boss Rafael Benitez has won the Barclays Premiership Manager of the Month award for November. Benitez bagged the award for the first time after guiding his side to third place in the league table. Four consecutive league wins and four clean sheets in November extended the Anfield club's unbeaten run to eight league games. During this league campaign, the Reds have not lost a league game since 2 October and enjoyed a 100% record in November with away wins at Aston Villa, Manchester City and Sunderland, as well as a victory at Anfield against Portsmouth.